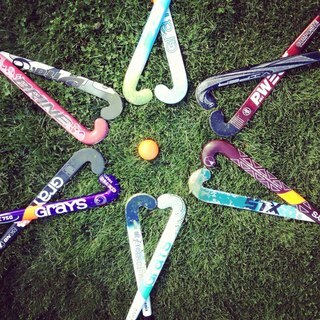 Field hockey is a team sport of the hockey family. The earliest origins of the game date back to the Middle Ages in England, Scotland, France and the Netherlands. The game can be played on a astro turf or a turf field as well as an indoor board surface. Each team plays with eleven players, including the goalie. Players use sticks made out of wood, carbon fibre, fibre glass or a combination of carbon fibre and fibre glass in different quantities (with the higher carbon fibre stick being more expensive and less likely to break) to hit a round, hard, plastic ball. The length of the stick depends on the individual player's height. Only one end of the stick is allowed to be used. Goalies often have a different kind of stick, however they can also use an ordinary field hockey stick. The specific goal-keeping sticks have another curve at the end of the stick, this is to give them more surface area to save the ball. Wick's uniform consists of a shirt (White and green) a skort (Green), white socks, shin guards and astro boots.